Old Crossleyans are only one point above the Yorkshire Two drop zone after they suffered a 35-30 home defeat to Grovians and Leodiensian won 31-0 at home to Wath Upon Dearne. The Broomfield men’s two bonus points kept them just above relegation rivals Leos with two rounds of fixtures to go. Old Grovians were making their first appearance at Broomfield in their relatively short history and must have been delighted with the home side’s generosity. 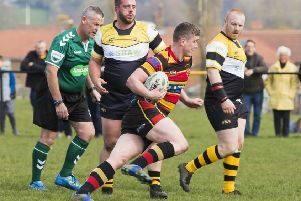 On the back of two good wins against sides in the top half of the division and a victory in Bradford in October, home supporters were optimistic of another survival boost. The rare withdrawal of Andy Day, through a training injury, hampered their ability at anchoring the scrum as the game progressed. Experienced Richard Wheale and big South African lock Troy Frisch were also injured. Gilbert Gregory, James Cooper and Kevin McGill were their respective replacements. The opening minutes gave no indication of what was to follow as Crocs stormed onto the attack. A break from Joe Wilkinson was continued by Gareth Sweeney and Devin Wells was tackled a metre short of the try line. Raman Sembi stole ball at the resulting line out and Cameron Brannan was driven over for the opening score, Ryan Sweeney converted. Needless penalties were conceded and the impressive boot of scrum half Ben Brown cut the deficit to 7-6. James Wainwright was keeping the Crocs in the game with a series of turnovers, but further penalties kept the home side penned in their own half. When Crocs failed to find touch with a clearance, good handling by the visitors gave them their opening try. Ryan Sweeney closed the gap to three points with a penalty, but Crocs left a huge gap at the side of the ruck and winger Pad Burns gleefully strolled under the posts for the visitors to take a 20-10 half time lead. A loose pass from the Grovians fly half led to Ryan Sweeney kicking another penalty. From the restart, there was a good catch under pressure from James Cooper and strong drives from Boj Sembi and Cameron Brannan. The ball was spread wide to Gareth Sweeney, who used the supporting Wilkinson to put Wells under the posts, Ryan Sweeney tagged on the conversion for 20-20. The comeback was short lived. Crocs’ scrum buckled on their own put in, a line out was lost, tackles missed and the visitors full back Anthony Griffin put right winger Alex Masterton in for a try. Worse was to follow for the home side when skipper Jack Hammond had to leave the field injured and No 8 Ollie Coyne was sin binned. The remaining 14 showed considerable spirit. Grovians looked sure to score from a five metre scrum but Crocs heeled against the head. However, further pressure resulted in the visitors stretching their lead to 12 points with another try. Replacement prop Phil Schedlbauer made a strong break which led to the Crocs moving the ball wide and an inside pass saw the supporting Cooper give a glimmer of hope, although the conversion hit the wrong side of the post. A penalty for an alleged high tackle gave the ‘men in green’ a further cushion, but Crocs were not finished. Good handling and strong running in the backs paved the way for Zane Sanders to put Gareth Sweeney in for his second try. This was crucial as it gave the Crocs a bonus point for four tries and brought the score within seven points for another valuable point.